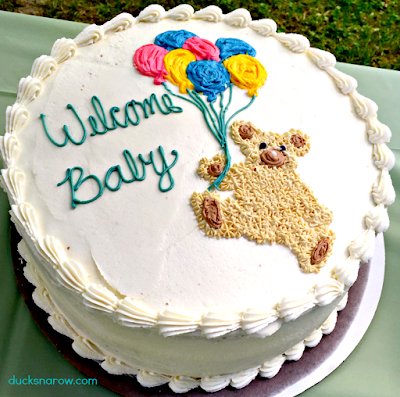 This sweet little Teddy Bear with balloons adorns a delicious Baby Shower Cake, made in expectation of the arrival of my newborn great grandson, Ben. Though it was made for a shower for a boy baby, it surely can be made for girl babies or, with a Happy Birthday message instead for a birthday party. The cake’s texture and flavor is reminiscent of a velvety white wedding cake. Can you say “best ever?” It is! Add wet ingredients- water, sour cream, oil, almond and vanilla extracts and eggs. Beat on low speed for about 4 minutes, some lumps will remain. Bake until tops are lightly browned and toothpick comes out clean – about 25 minutes. Cream the butter and sugar, adding the sugar a little at a time. Add vanilla and milk to the consistency you want. **This cake was made by my niece, Lauren, who is a professional pastry chef. It is not beneath her to use a box mix as an ingredient once in a while as she did in this case. The secret to her frosting is that she used a mixer on a stand so that she could blend the frosting ingredients for long periods of time and, let me tell you, it was worth it. It tasted amazing!